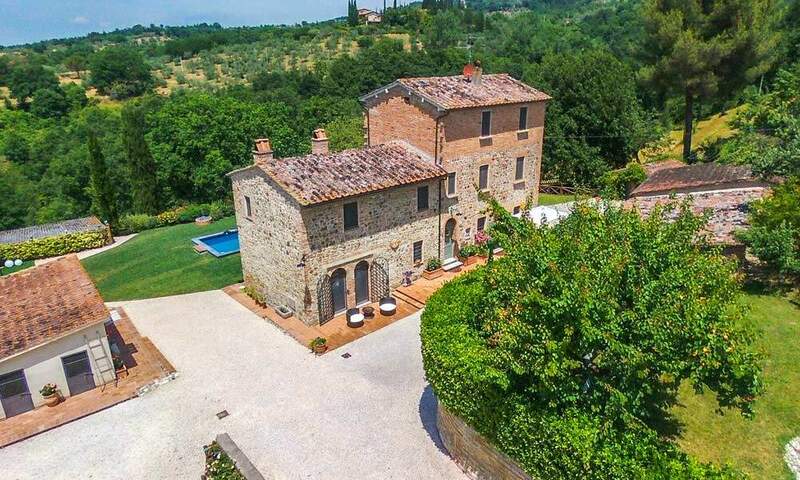 Here is a home that provides a country lifestyle and yet it is minutes away from one of the most charming towns between Tuscany and Umbria: Città della Pieve. 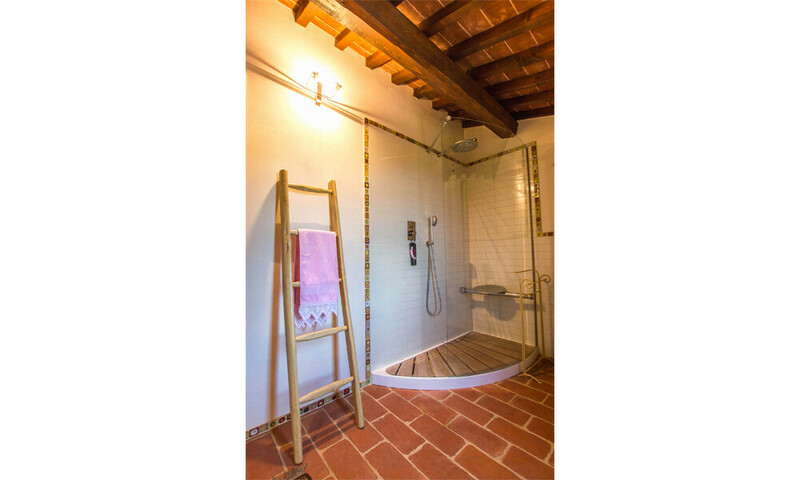 The casale is traditionally restored, with admirable care for details: from the sockets in the kitchen painted the same colour as the tiles, to the nautical strings used as skirting boards, everything looks as perfect as in a fairy tale. 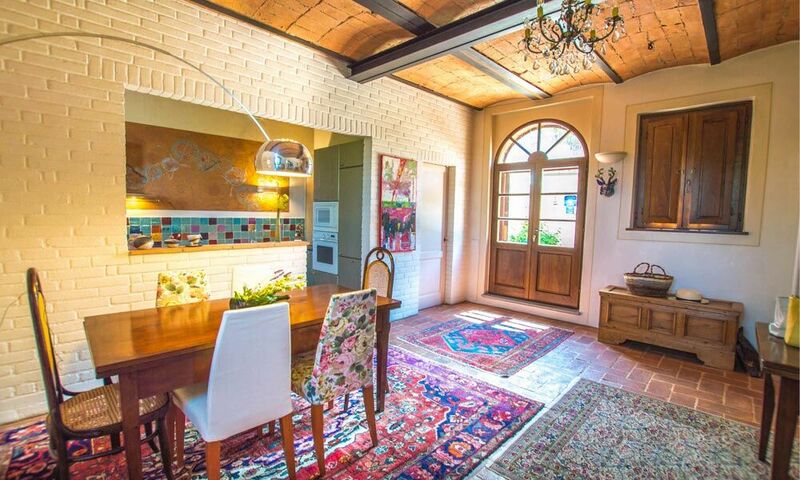 With its adorable main house, and several annexes – including a pizza oven, a cellar, a garage and a few storages – this property guarantees plenty of space to live and enjoy every single moment of your life. 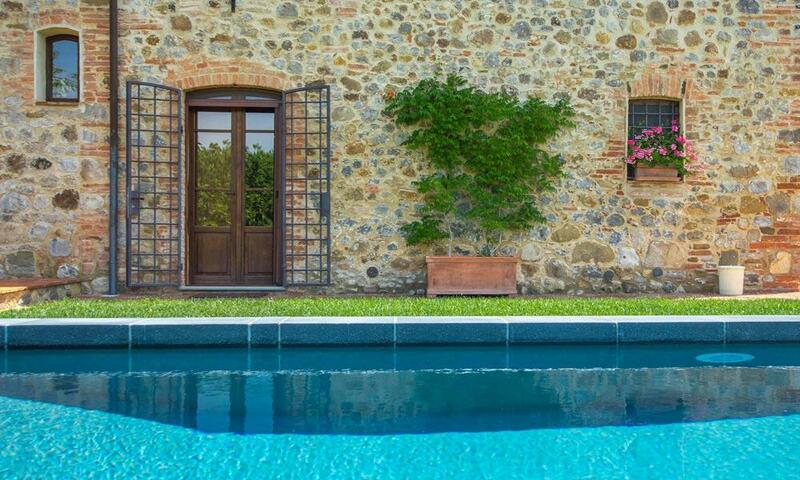 And when you feel it’s time to take a break, a jump into the swimming pool or a few minutes into the Jacuzzi, will give you back all your energies. 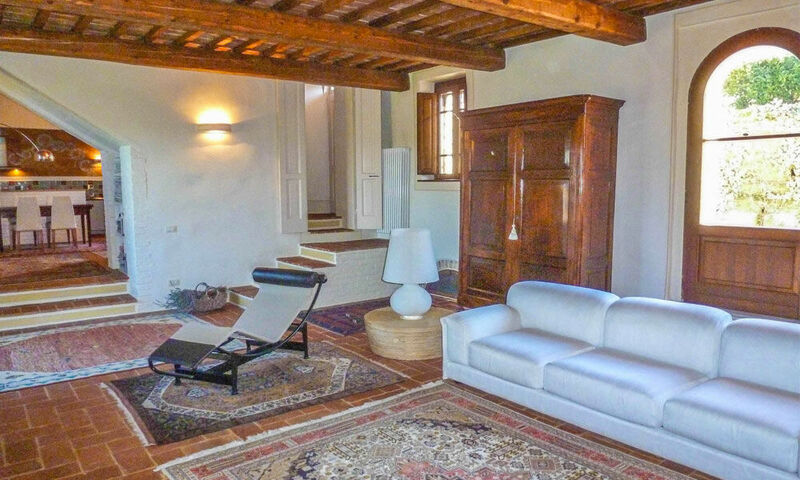 The main house is a traditional farmhouse, fully restored recovering the original materials of the Umbrian building tradition. 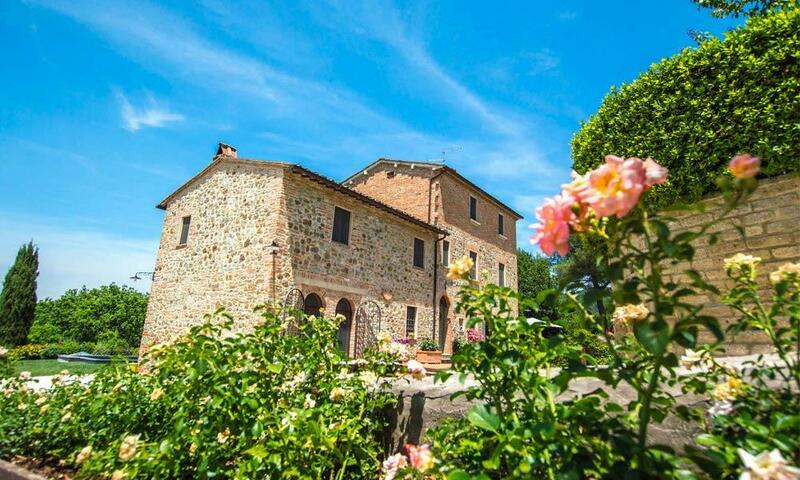 the main entrance features two openings to the sides and the grand staircase typical of rural buildings in front of you. 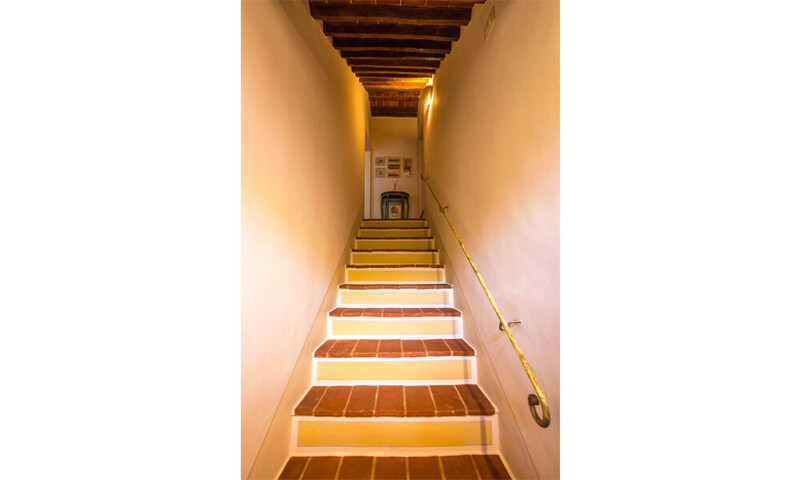 Normally, farmhouses used to have stables on the ground floor, while the living area developed on the upper floors, that’s why the need to have immediately a stair, leading upstairs. 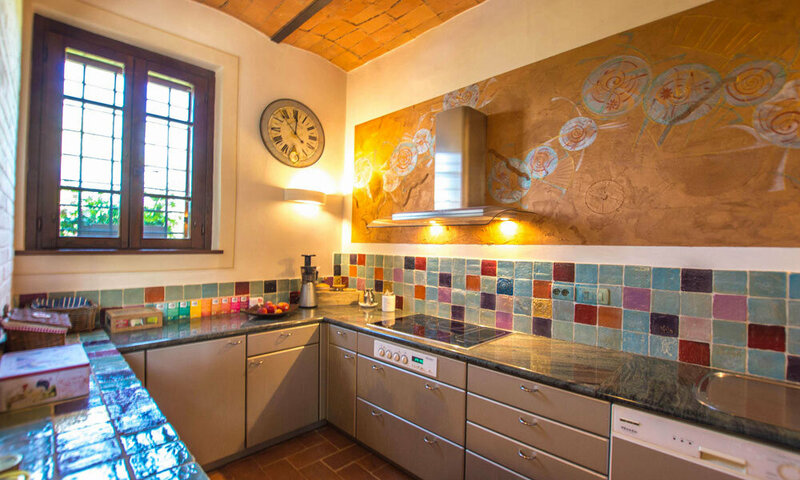 While on the ground floor, if you walk on the left, you enter the spacious and luminous living room, with french door leading out to the garden and pool area; on the right you find the dining area and kitchen. 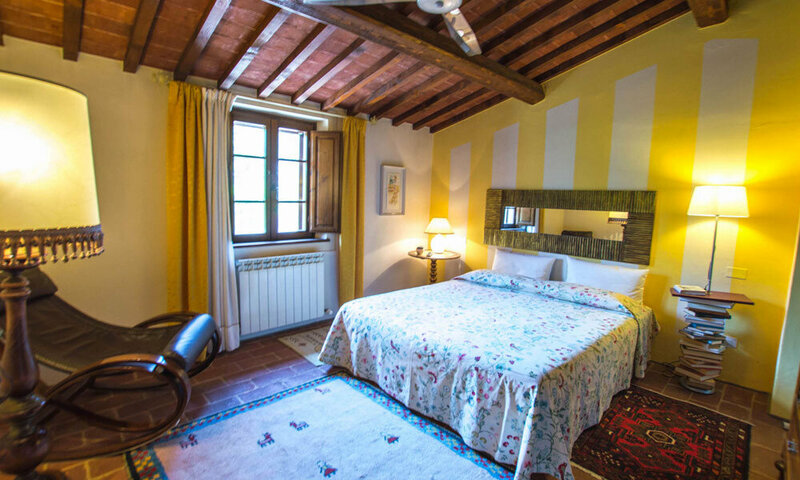 All rooms are warm and cozy, thanks to the use of cotto tiles on the floors and ceilings, as well as wood beams. 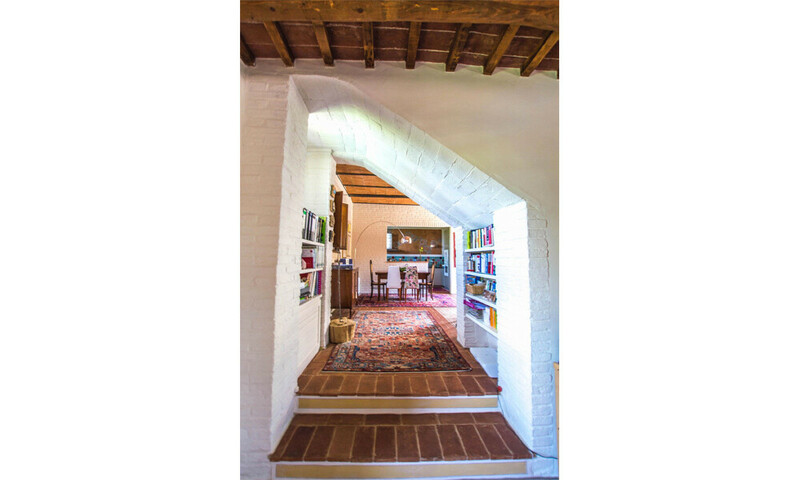 The original stones used to build the house, are wisely alternating with white plastered walls, to give the look of a spacious, bright and neat environment. 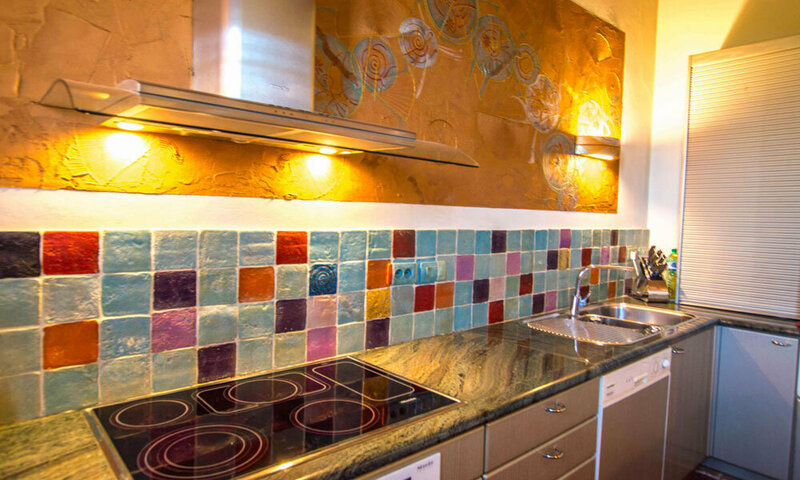 On the other hand, the colourful tiles used for the kitchen wall, creates a joyful contrast with all the other walls. 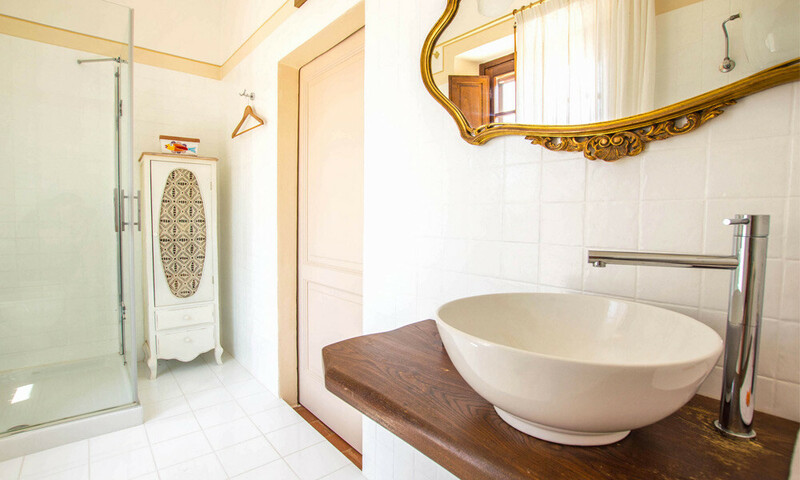 On the same floor, there is also a guest bathroom. Stepping up the first floor, you access the sleeping area. 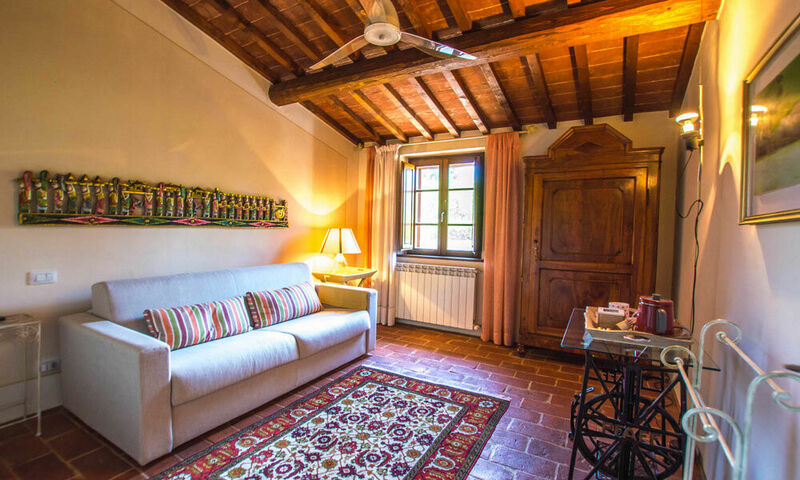 The current owner has chosen to create 3 suites instead of simple bedrooms, in order to guarantee maximum comfort to all guests, who can just rest on bed or have a chat on the soft sofas in the lounges. At the moment you have 2 bedrooms, 2 lounges and 2 bathrooms on the first floor, while there is a third bedroom, a lounge and a bathroom on the second floor. With no works, you could easily get a total of 5 bedrooms and 3 bathrooms in the sleeping area. 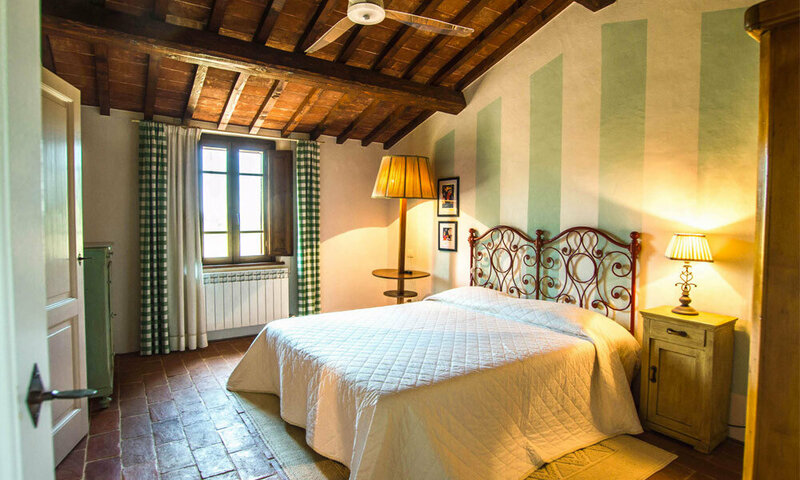 All bedrooms are beautifully and elegantly decorated; they all feature cotto floorings, cotto tiles on the ceilings and wood beams, except for one bedroom, where you have barrel vaults with cotto tiles painted white. 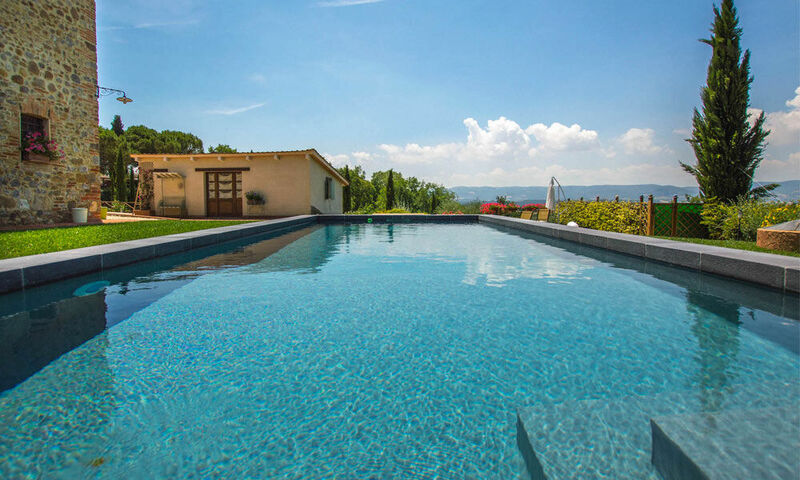 From all rooms you can enjoy nice, relaxing views, especially from the side facing north-west: from here you can see the pool area and admire a beautiful landscape of hills and woods, stretching onto Monte Cetona. 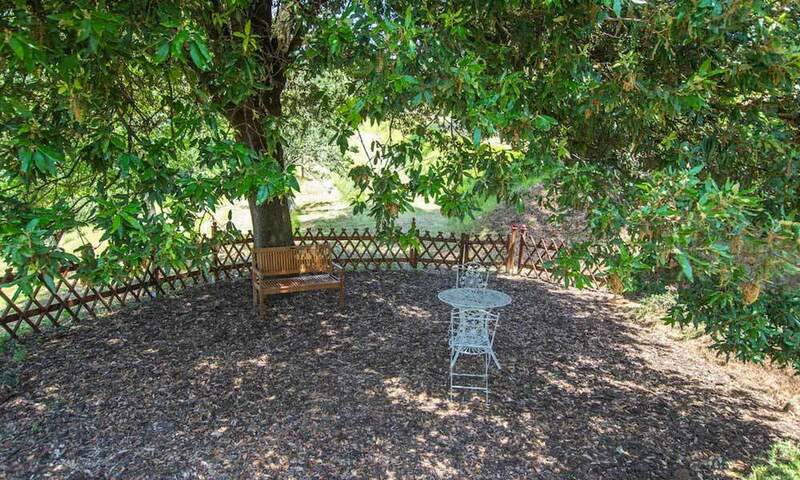 The property enjoys several annexes. The first one is right beside the main house and it is a garage for up to 3 cars. It can be used in addition to the large parking area close to the gated entry. 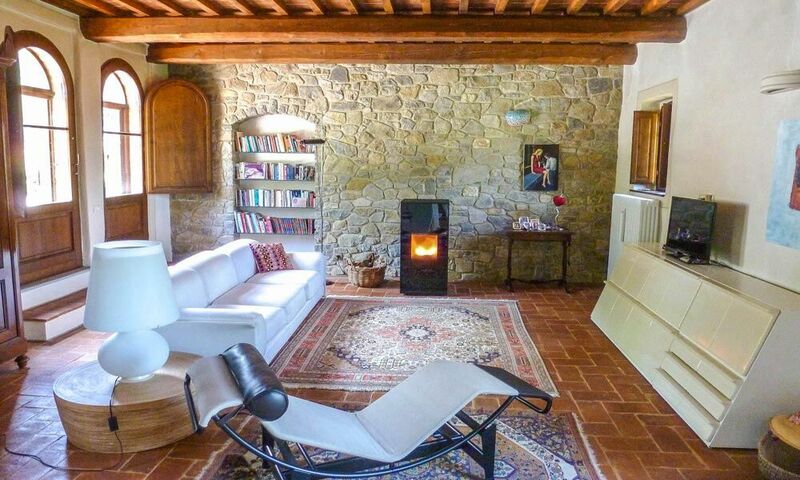 Opposite the house, there is a big outbuilding, divided into several areas: storage, old cellar for the production and storage of wine, an old oven used in the past to cook bread and now perfect as a pizza oven. A big tank to store rain water and water coming from the spring downhill was created in the past and it can collect up to 40.000 litres. This is very useful for irrigation, while the house is also connected to the mains water. A third annex, hidden from sight, is used as a storage to keep all the tools and machines for gardening. 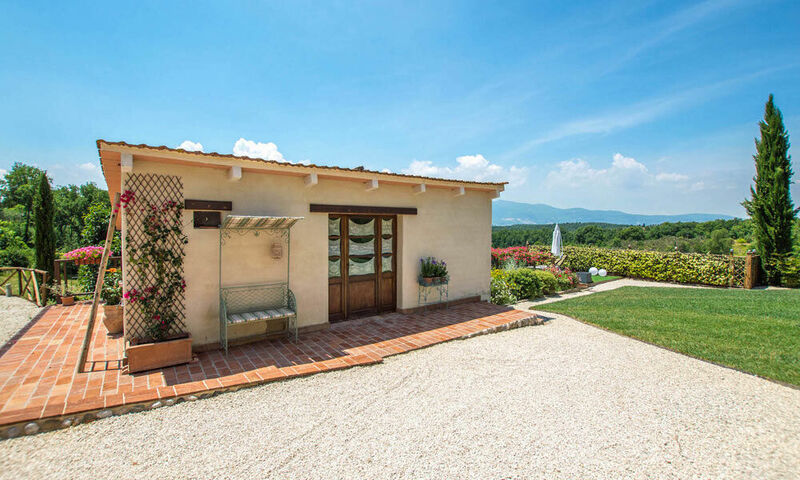 This lovely farmhouse is surrounded by a 2.4 hectares land, mainly wood with no special maintenance required, partly arable land and a plot where you can place a small vineyard, to produce your own wine. 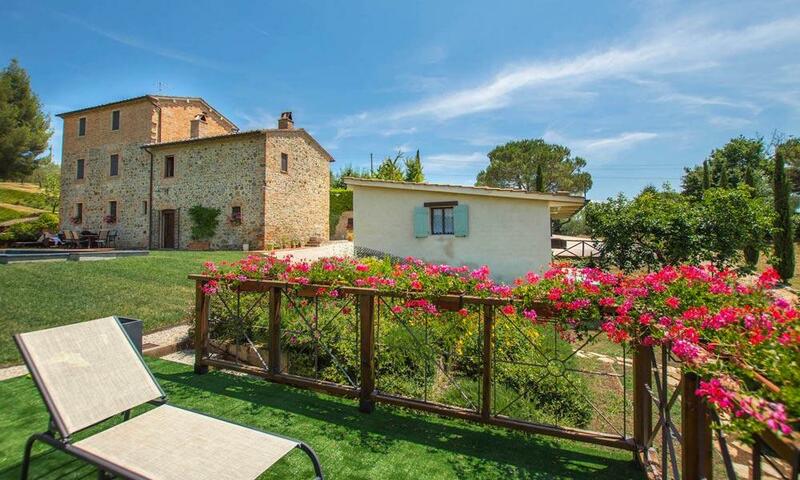 The 70 olive trees, will let you produce olive oil for your own consumption. 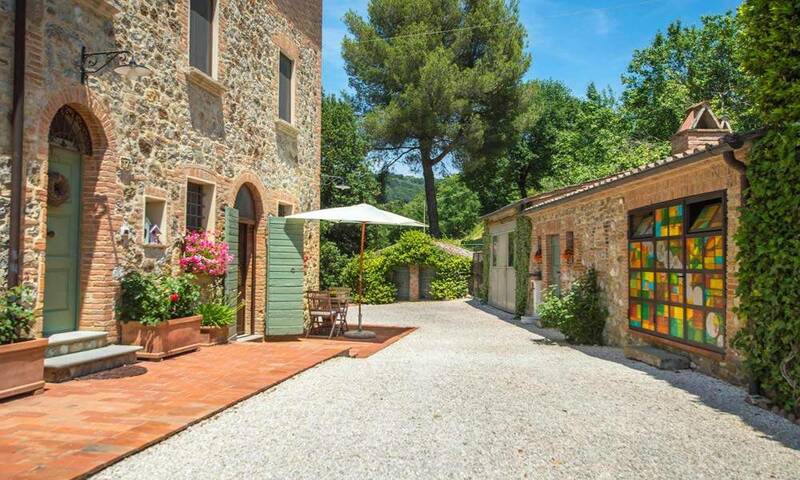 The mature garden extends over a lovely small terrace with spectacular view of the valley and stretching onto Monte Cetona in Tuscany. 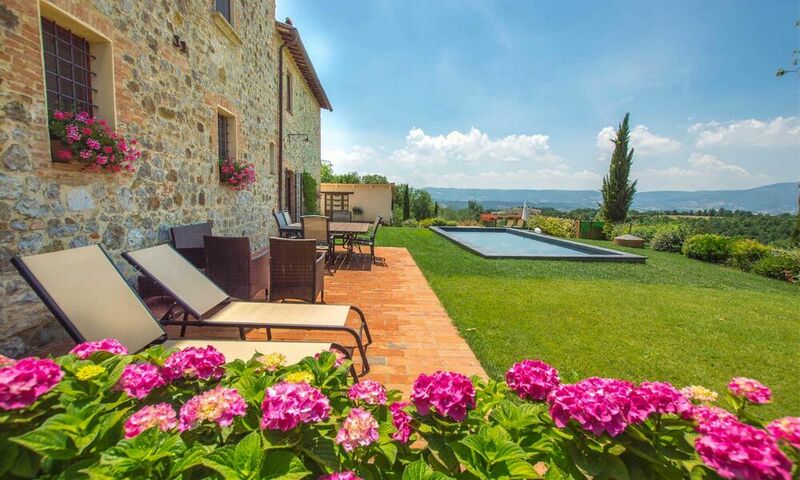 The automatic irrigation system will let you save time and live in a free state of mind. A Jacuzzi for 5/6 people with water jets, blower, aroma therapy, waterfall, anatomical headrests, heating, colour light system, ozone sanitization system is placed in the front garden: sitting in the comfortably warm water can help you slow down and forget about the busyness of your day. It is proved that immersing most of your body in warm water will provide physical and mental benefits. 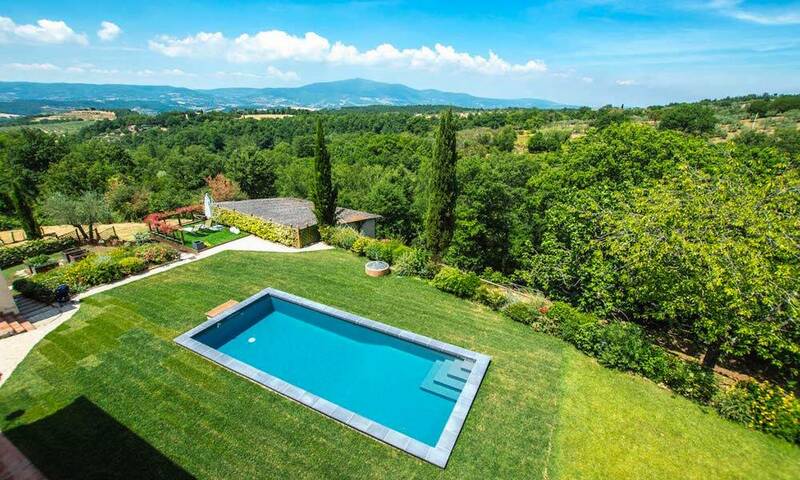 A 8,5×3,5 metres swimming pool has been installed in 2017, with a dark grey liner that perfectly harmonizes with the surrounding natural environment. And when it comes overnight, all the villages from a distance light up, blowing the sky, creating a very suggestive atmosphere, that you can admire right on the outdoor dining area. 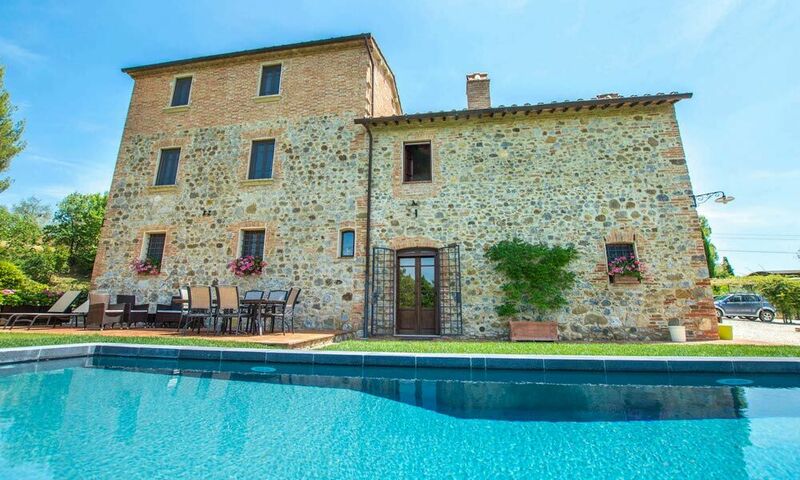 Enjoy a glass of wine or a cup of freshly brewed coffee as you sit by the pool, looking at the stars. 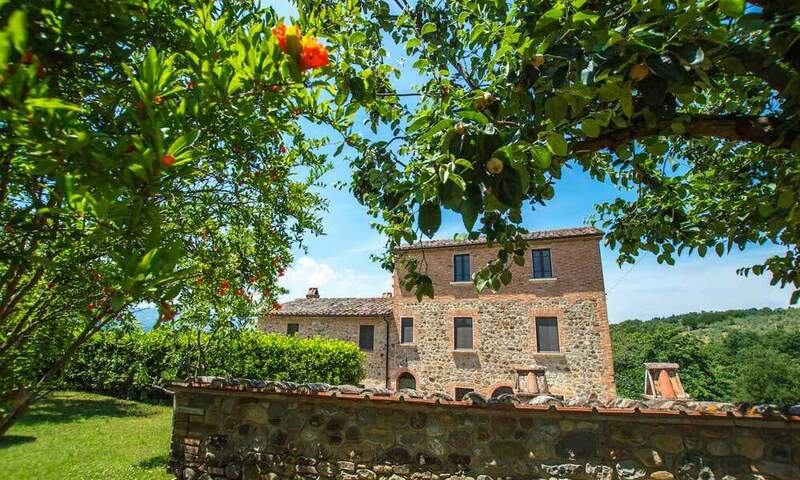 This property is also full of history: a few years ago, close to the house, an Etruscan tomb was found. It contained two intact sarcophagi and several cinerary urns, belonging to a well known Etruscan family clan, originally from Chiusi, and dating back to the 3rd century BC. 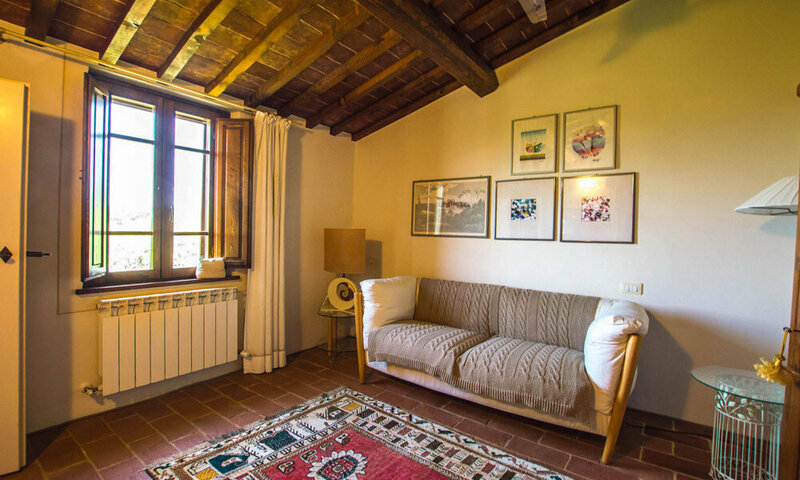 In the house, during the restoration, an Etruscan grotto was found below the living room area and now you can see it, thanks to the glass hole on the floor. Also the original winery in the big annex is very old: the big stone tank reminds of the time when people used to step on the grapes to get wine that was to be stored in the grotto underneath, where there is an ideal temperature for the preservation of wine. 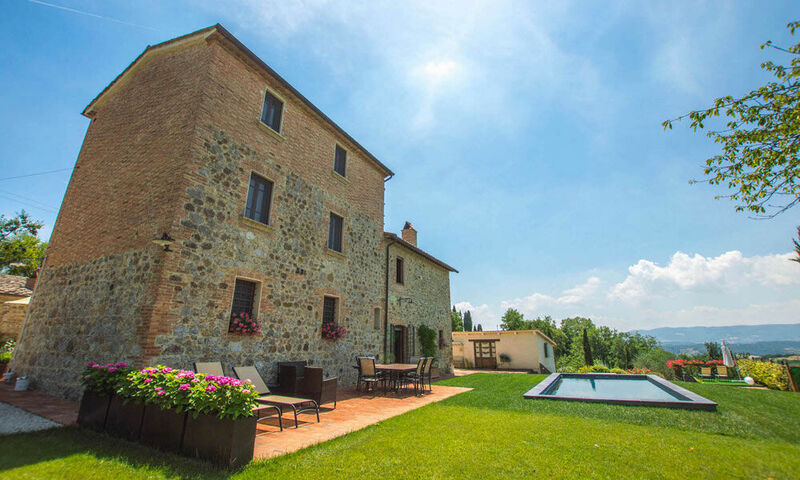 The farmhouse is located in the unspoilt countryside near Città della Pieve, about 4 kms from town: no motorways, no pilons or other modern constructions to spoil your peace and views. 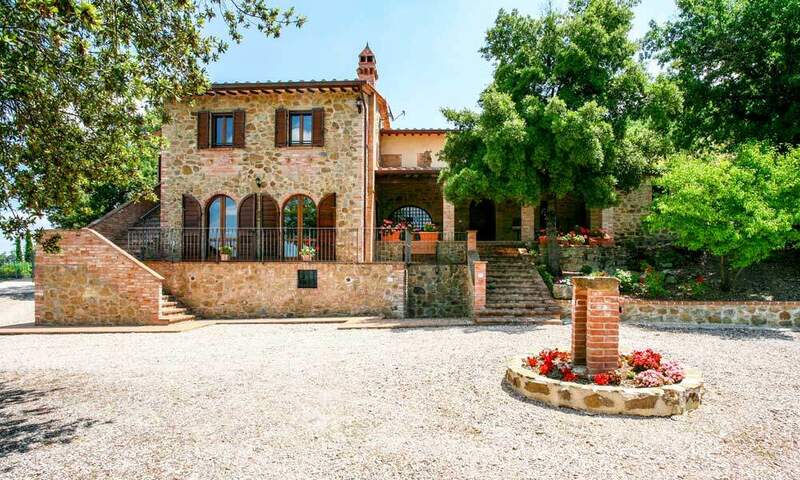 The location is secluded but not isolated, with a few neighbours that you don’t see once you close the gate, since the property develops on the opposite side and unrolls down to the valley. Reaching the house is very easy and comfortable, because the road to the house is very well maintained. 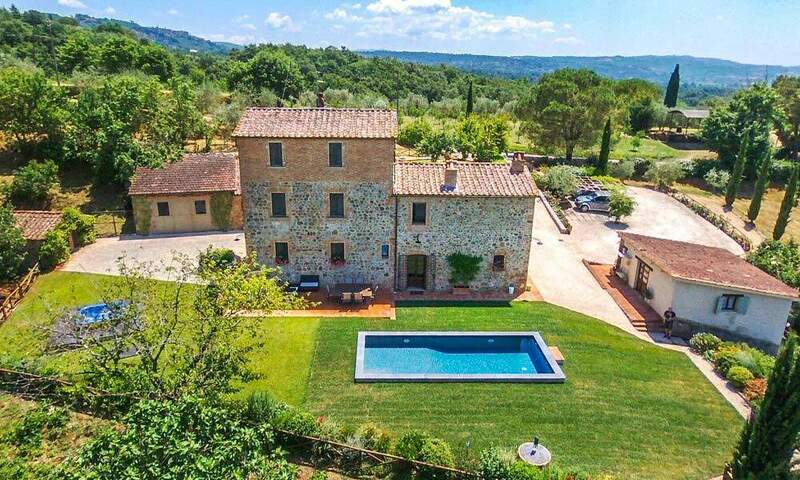 The property is close to many Tuscan and Umbrian amenities, as Montepulciano (35kms), Lake Trasimeno (30kms), Perugia (42kms), Val d’Orcia (50kms). Also an important Golf Club is just 25 kms away, for you to spend some time excercising. If you are looking for the perfect house, ready to move into, this is ideal: no works to be done, everything is simply perfect as it is. Step into and enjoy. 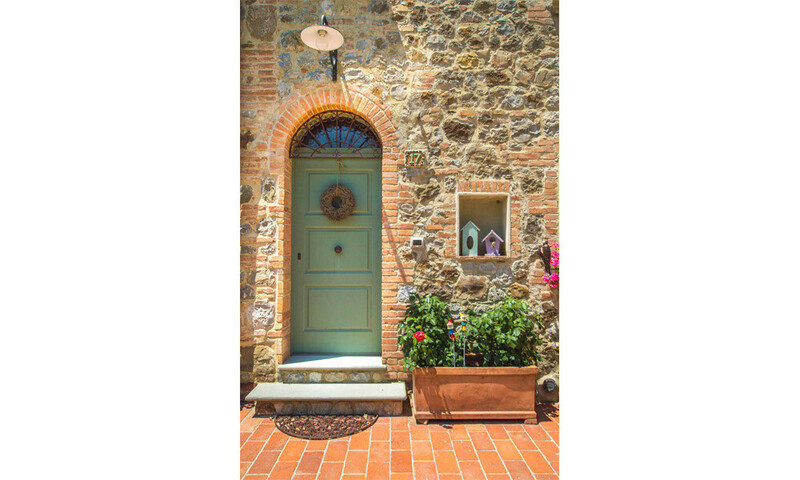 When you see it, you’ll immediately feel at home and you’ll understand all its potential: the size of the house, makes it perfect as a family home, with a nice garden, that won’t take out all your energies and time for maintainance. Plenty of space for your hobbies, tools and cars. 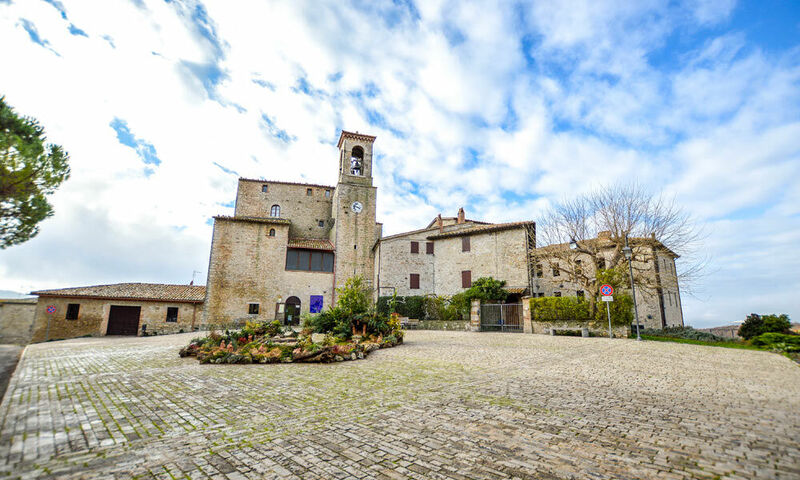 The proximity to Città della Pieve will let you be part of a small, true Italian community, although your private retreat will be in the middle of the beautiful countryside of region Umbria. 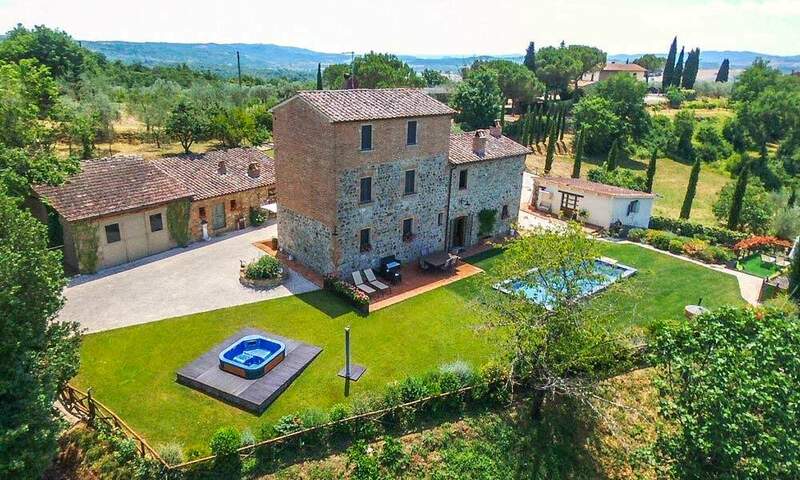 Last but not least, this property has a great potential as a high-end holiday villa, that you can rent out to people, who’d like to visit Umbria and Tuscany, without sacrificing the pleasure of a cosy place, in the middle of the nature, with full privacy guaranteed. 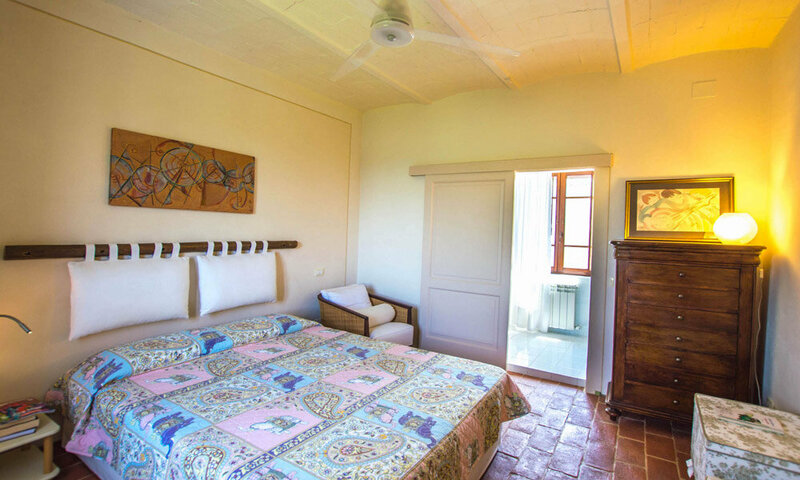 The main house is now divided into 3 luxurious suites, but you could easily get 5 bedrooms, by turning the lounges into bedrooms. 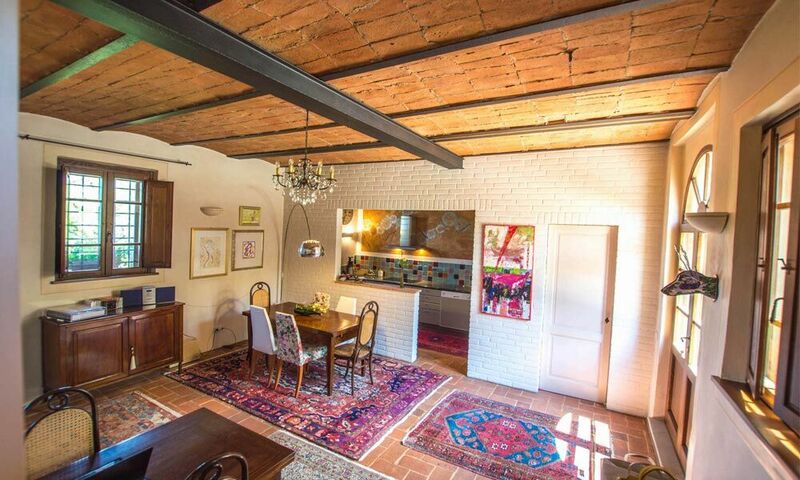 Moreover, it is possible to enlarge the buildings, thus obtaining additional bedrooms. 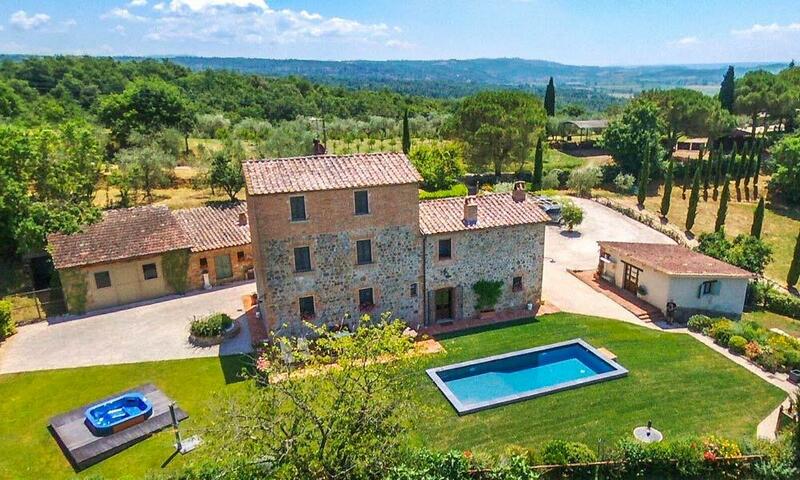 The location in Umbria, just 5 kms away from the Tuscan border, makes it very attractive for all those who want to discover two among the most beautiful and attractive regions in Italy.